The Republic of Fiji Military Forces (RFMF) will be test-firing its six new ceremonial guns on Monday. These guns were donated by South Korea on Tuesday to replace the old 25-pounders. The new guns would be used during the Fiji Day celebration at Suva’s Albert Park. Land Force Command chief of staff, Lieutenant-Colonel Sitiven Qiliho advised members of the public not to be alarmed when the new guns were fired. During the handover at the RFMF Engineers Headquarters at Nabuni Camp, Nabua, the RFMF Commander, Brigadier-General Mosese Tikoitoga, said, “We had a bit of problem in getting ammunitions for the 25-pounders, so we went to the Korean government and asked for Korean Aid to help them maintain this RFMF tradition in firing ceremonial guns. 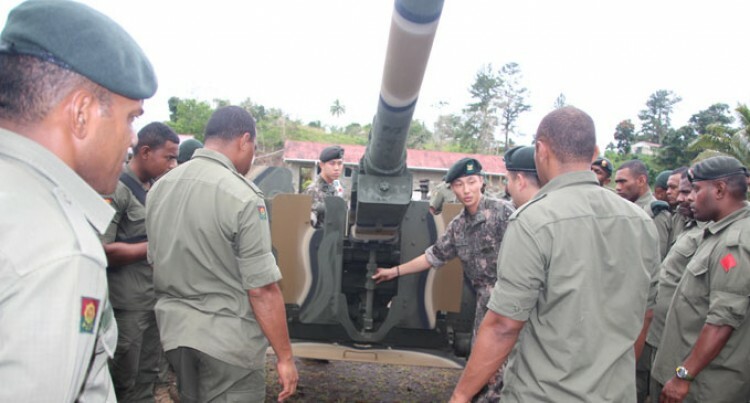 Brigadier-Genaral Tikoitoga,said these guns were the biggest acquired by the RFMF and they were grateful that the South Korean government assisted them. The 25-pounders that were used before had been with them since the early decades of last century. Some soldiers had been trained by their counteparts from South Korea on how to use the new guns and they should be ready during Fiji Day celebration. These guns were used during the Korean War. Here in Fiji, the guns will be used only for ceremonial purposes, but the Commander said they could also be used in the battlefield.